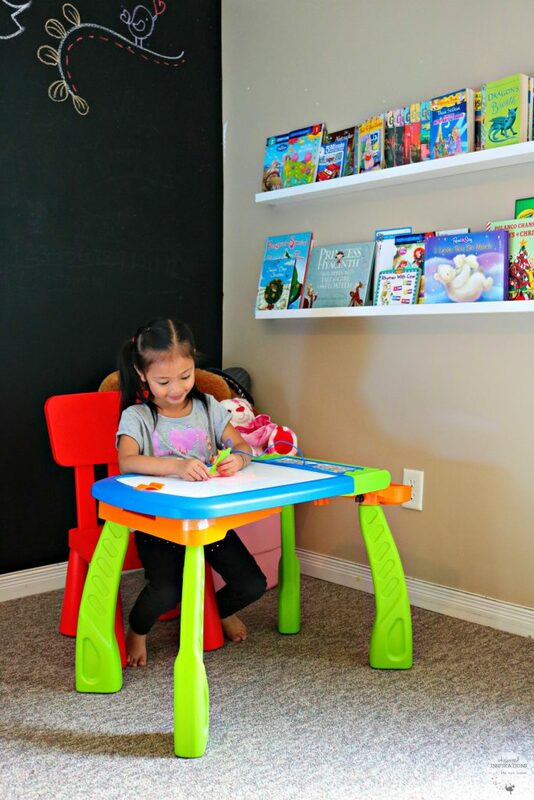 You are here: Home / Product Reviews / Babies & Kids / Keep Kids Minds Active with VTech’s DigiArt Creative Easel All Year-Long + Giveaway! We are a couple of weeks into school and settling into a new routine. Mimi just started Grade 1 and she is excited to go to school everyday. Her teacher is super creative and has so many fun ways for kids to learn. Needless to say, she is coming home having learned many new things. One of the things that we always push for at home is fun but, we find ways that will help the girls strengthen the skills they’ve already learned. That’s why I love when I discover products that are both things. If they are both fun and educational, I am more than happy to try them out with the girls. 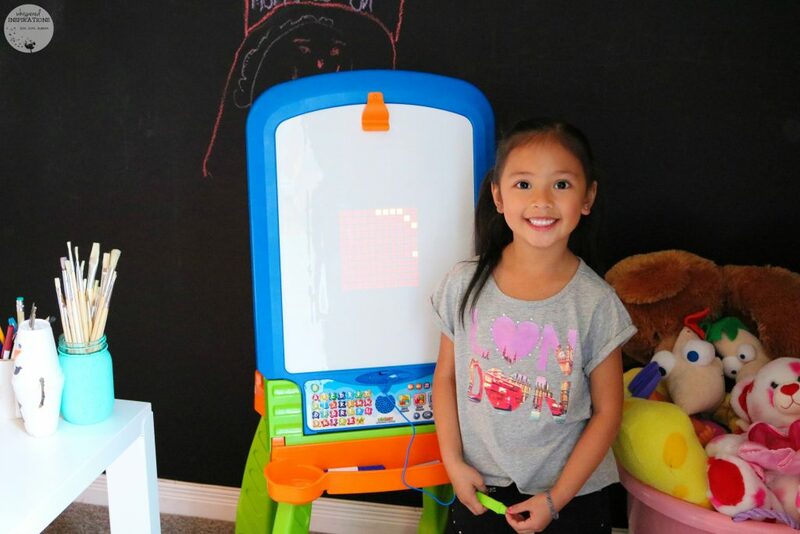 The VTech’s DigiArt Creative Easel is an innovative toy that can be transformed from a light-up dry-erase board to a chalkboard and drawing table for three fun ways to play! Mimi was incredibly excited to give the easel a try. While she is older, she practices her letters daily. 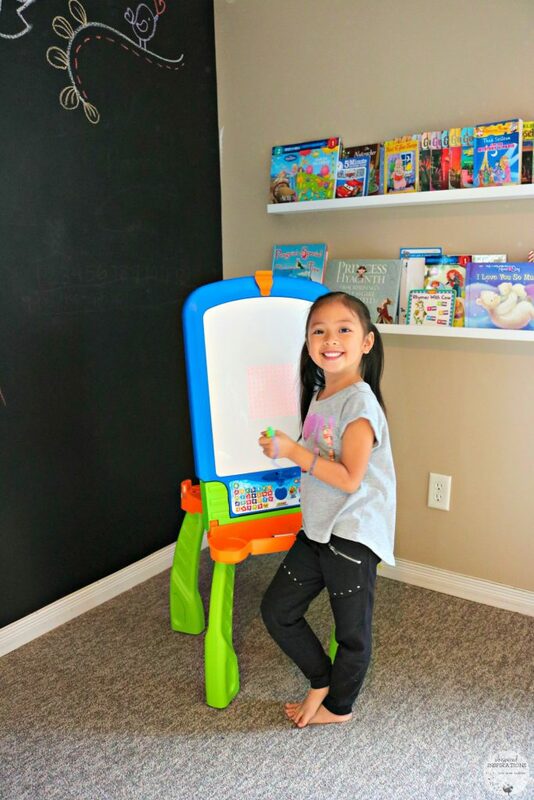 The best part of this interactive toy is that kids can learn to draw, write and more! 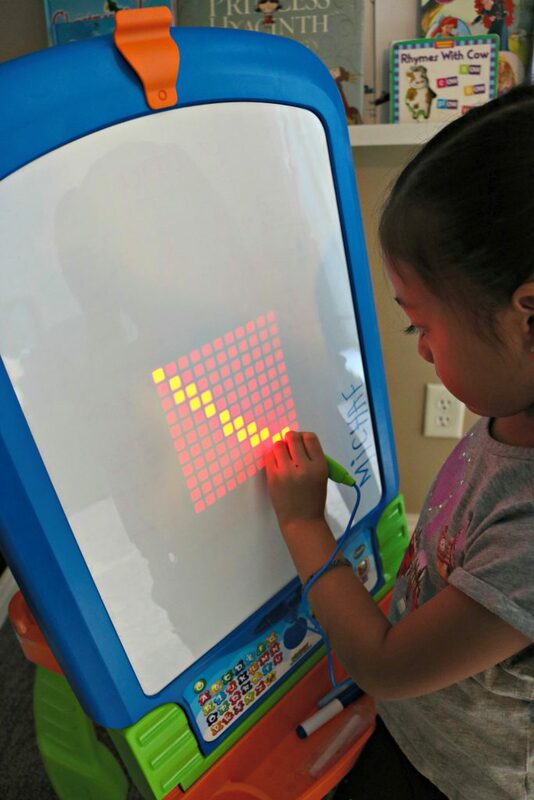 This fun, interactive easel can be transformed from a light-up dry-erase board to a chalkboard and drawing table for more ways to play, combining learning and creativity. You can help your child explore the learning activities and learn to draw more than 100 objects and shapes step-by-step by following the lights using the magic pen. Then learn letter and number stroke order for uppercase letters A-Z and numbers 1-20 stroke-by-stroke. When it comes to being creative, Mimi loves drawing whatever comes to her mind while listening to 10 classic songs. What makes this easel so versatile is not only are there different uses but, how simple it is to transform it. In seconds, you can change the easel to whatever your child wants to do. Once I realized how easy it was, I was blown away! The Dry-Erase board is one of Mimi’s favorite functions of the easel. You can use it in an upright position or you can grab a chair, sit down and make it into a drawing table. The easel comes with 3 pieces of chalk and a dry-erase marker. It also has a clip to attach blank paper to create and paint masterpieces! All around, it’s an amazing toy for kids who are just starting to learn or for kids like Mimi that are honing their skills. She spends a lot of time on it after school and since it’s light, it can be moved anywhere. She can use it in her “fun zone” in the basement or in her room upstairs. This toy is recommended for kids aged 3 to 6 years-old. If you think your child will absolutely love this VTech DigiArt Creative Easel, you can pick it up at Toys ‘R Us for $79.99. One lucky Whispered Inspirations reader will WIN one though. This contest opens on September 29th, 2016 and closes on October 14th, 2016. This contest is only open to CANADA. I know Mimi will be strengthening her skills at home for a long time to come and it’s great that she has one tool that can help her with it! For more information, head over to VTech and follow them on Facebook and Twitter for their latest updates on all things toys! Who in your life would love to use this easel? I think my niece would love this toy, she is at the perfect age for it! so much to like about this easel! the 10 classic songs is a great bonus to, my girl would love to have this! Two of my youngest grandchildren would absolutely love this! Creativity is really the key to everything! I would love to win for my son. Ethan! Thanks! My nice would love this, so would the other kids in my family! would love one for my step grandkids.They would have hours of fun! I love how easy it is to transform! Love the music, how easy it is to transform, and the chalkboard activity! Both of my children would love this! My youngest grandsons would absolutely love this! My grandson would love the Dry-Erase board to keep track of his sports, chores, and homework schedules. I love that this can be used as a desk or an easel! I like to win this for my niece. I like how you can learn to draw objects. I think my son would love this toy as he is very creative and loves drawing! My son would love this. I like that you can draw 100 objects, that is a pretty neat feature. my great niece would love this, she loves to draw and paint pictures. This would be for Emily who is very artistic. She draws pictures for me all the time and I have plenty on my fridge. I like that it transforms from a dry erase board to a chalkboard! My three girls would love this, but my middle one, honestly an amazing little artist, would probably enjoy this the most. Thank you for the chance! If I won I would give it to my great niece. She would absolutely love this. my daughter would love to be creative with this toy! I am sure my niece or my nephew would have a ton of fun with this. Perfect Christmas present! This would be beautiful for my granddaughter! I would love to win for my two granddaughters, they would love it! I love all the feature, hard to pick my favourite. I would have to say that you can use it up right or as a drawing table. I love how this is a fun and educational toy and that it is versatile with 3 different ways to play. My daughter Adalynn would LOVE this. Thanks for a great post and for a chance at winning one. My 2.5 yr old grandson would love this! I love that it converts into a table! I really love the feature of it lighting up when using a special pen! This would be awesome for my son. Love that it goes from easel to table! My youngest grandchildren would have an absolute blast with this wonderful toy! This easel would be great for my son to use for learning. Both of my sons would love this! They like to get creative! My son or daughter (when she is old enough) would love this! my great niece is quite the budding little artist, she would love this. My niece would love this easel. Love that there are so many ways that they can use this easel! Great product! This would be perfect for my niece or nephew. they can share when they visit each other. I would just love this for my grandbabies! They would love it! 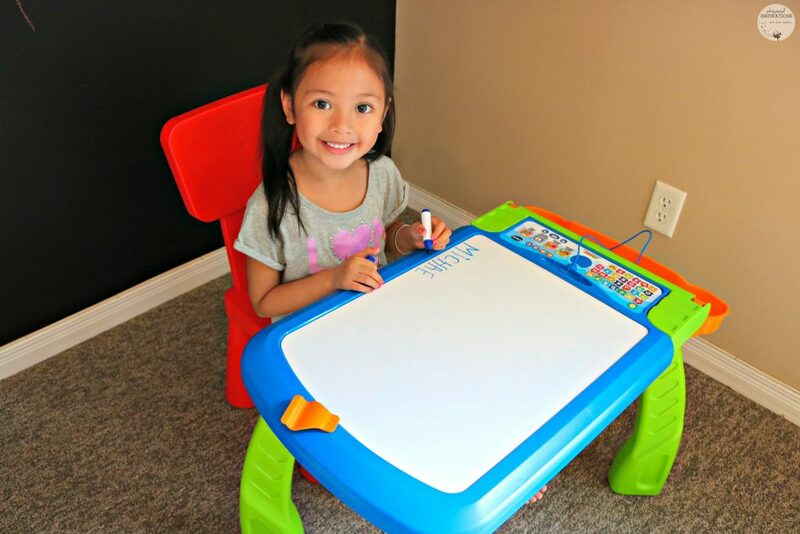 my niece would love using the dry erase board! My niece would really enjoy this toy. I love that it has a dry-erase board! My niece C would love to draw with this easel. I would love to win this for my daughter. I like how it can convert from an easel to a table and that it can be interactive with my child. This is so unique! I love that it has learning activities built in! My little granddaughter would love this. She is so eager to learn, and create. My granddaughter would really enjoy this ! Love that it is a multi-use art table, so great! What a perfect Christmas present! I love that it plays music! My son Mac would love this toy! My youngest daughter would love this toy and I love the music feature. My niece would be so excited to get this easel. My girl would love to have this and share with friends! My niece loves to doodle so this would be a great gift for her! I love that it lets kids be creative! I think my niece would love playing the with the electronic lights on this! I think my two older ones would love this ESPECIALLY my two year old son. love this, for my great niece. My daughter would lose her mind over this! I would love this for my little girl. She is in grade one and she would love to practice her letter on this. She also loves to draw. We would save a lot of paper. Thanks for the chance to win. My niece C would love this easel for her birthday. I have 2 kids that would love to fight over this! oh my my great niece would LOVE this. for my girl……10 classic songs, Love that!!!!!! The perfect present for my niece, I am happy you brought it to my attention! What a great tool to use to get those imaginations put out there for all to see ..creativity is such a wonderful thing to instill in children I have a few special ones in our family that would love to be creative thank you for the opportunity to enter this would be a fantastic win ! My son would love to use this easel to paint! My son would absolutely love this toy! I would love to win this for my niece. She woupd love it bc shes creative. My girl would love to use the magic pen! My granddaughter is just at the right age for this toy! My son would love that it goes from table to easel! I would want this for my baby! Love that the positions can be changed! Love how the table is interactive in several ways, would be great for my niece. My niece would jump for joy to have this easel. My granddaughter would love being creative with this! My niece would love this toy! My grandkids would just love this! Thanks! My nephew would love the lights feature/games! My niece C would jump for joy to have this easel. My niece C would jump up and down for this easel. My girl would also love the drawing board! I love that this encourages creative play! My niece would love drawing on this! Fingers crossed that I might be lucky enough to win this for my niece, she would love it! My three year old would love this! No more paper! I would love to win this for my granddaughter and like that she can listen to music and draw at the same time. My niece would love this…it is great! This would be amazing for my two youngest grandchildren! Thanks! My nieces kids would really love this. Would be great to win and spoil my niece with this! I love that it can help teach them numbers! My niece would love playing games on this! I have a few great nieces that would all love this. I love not using paper! My youngest niece would love this, she is very creative! I have a granddaughter and a grandson that would have an absolute blast with this! The whiteboard feature is great! One of the best learning and creative toys I have seen in years and being Grandma that means alot of years! 100 objects to draw…….my girl would love it! The person in my life who would love this easel is my niece. We have two precious grandbabies who would love this! This would be perfect for my niece to play with! I have a niece and nephew would love this. My niece C would love this toy. My niece would love this if I won it! My little cousin would totally love this. I love that you can make it into a drawing table! My niece would totally enjoy this – perfect birthday present! We have a granddaughter and grandson that would love to play with this! Thanks! My grandson would love this for his birthday Christmas Day ! My Niece C would love this easel. This would be so much fun for the kids to be creative !! I can see my niece having hours of fun with this, love that it can be used in multiple ways. This would be great to be able to give to my grandson and granddaughter! Thanks! My little neice would absolutely love this. I like that it comes with chalk – all ready to go for fun! My girl would love that she can use it as a desk or an easel! My little kiddo would love this especially the dry erase part because she loves to doodle and do storytelling. My niece would love this toy and she loves draw! My granddaughter would totally love being creative with this toy! My little nephew Nolan would get hours of fun from this! My daughter would really LOVE this!! Fingers crossed! Thanks for the chance! Love that they can use it different ways, my niece would love this! I love that it;s a teaching toy! My son would love the blackboard! My daughters would love this! They draw all the time. My preschooler would love the alphabet part! My daughter would love this. I think it is great to be able to use as an easel, but also have the option to turn it into a drawing table. My niece C would love to own this easel. My girl would love the dry erase board! my niece would love to use this as an easel for painting! I love that this makes learning fun! My niece would LOVE this and it would be the perfect Christmas present! 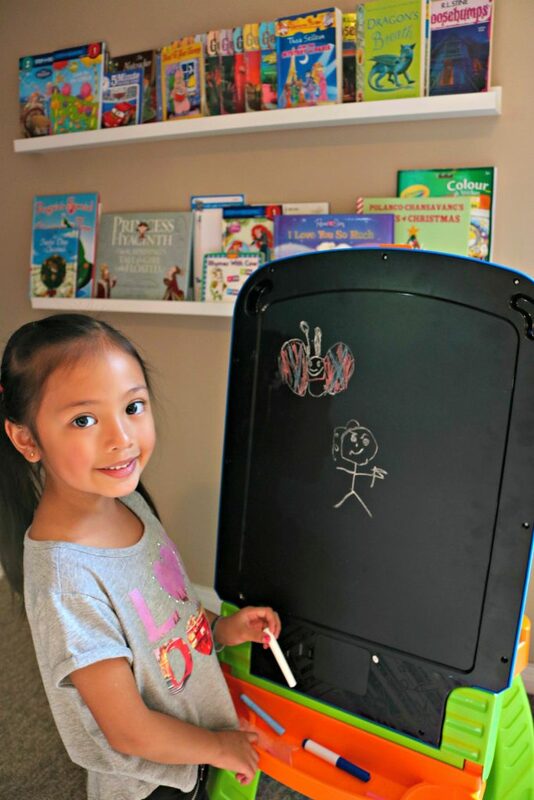 My oldest daughter will love the dry-erase easel! My niece C would so love this easel.